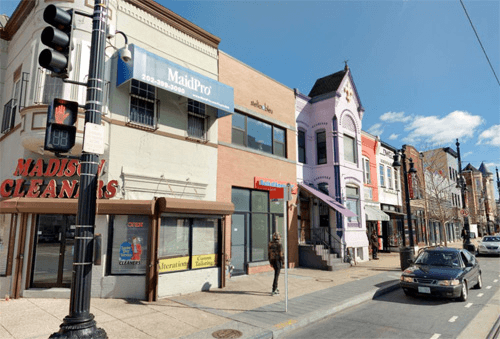 The H Street Northeast Neighborhood Mixed-Use Retail NC-16 Zone is a sub-district of the H Street Northeast Neighborhood Mixed-Use zone district located primarily along H Street, N.E. from Second Street, N.E. to 15th Street, N.E. The H Street Northeast Mixed Use Zones (NC-9 – NC-17) seek to encourage the clustering of uses into unique destination sub-districts along the corridor, specifically a housing district from 2nd Street to 7th Street, N.E. ; a neighborhood-serving retail shopping district from 7th Street to 12th Street, N.E. ; and an arts and entertainment district from 12th Street to 15th Street, N.E. Encourage retail uses and a scale of development and a mixture of building uses that is generally compatible in scale with existing buildings. The NC-16 zone is intended to permit mixed-use development at a moderate-density with an emphasis on the provision of retail uses. 1In the NC-9, NC-10, NC-11, NC-12, NC-13, NC-14, and NC-15 zones, new construction that preserves a building façade constructed before 1958 is permitted a maximum non-residential FAR of 1.5, provided that at least 1.0 FAR shall be occupied by uses in the following categories: (a) Office, provided that the office use shall not be on the ground story; (b) Retail; (c) Service; or (d) Eating and drinking establishments. 2 In the NC-9 through NC-17 zones, new construction that preserves an existing façade constructed before 1958 is entitled to an increase of 0.5 FAR to the maximum permitted non-residential density. 3 Except as prohibited on the roof of a detached dwelling, semi-detached dwelling, rowhouse, or flat in Subtitle C § 1500.4.